HYDERABAD: A 15-year-old girl chained by her father for not obeying him, was rescued by Longerhouse police in the city here. "We have rescued the girl and her father Akbar was taken into custody," Nagender, Sub-Inspector of Police of Longerhouse police station, who is probing the case said on Tuesday. Angered for not heeding his warnings Akbar, an illeterate, had chained her daughter of his second wife Unissa Begum to a table for the last 10 days in their house in order to control her movement, he said adding that Akbar had warned her daughter not to go outside without informing him. 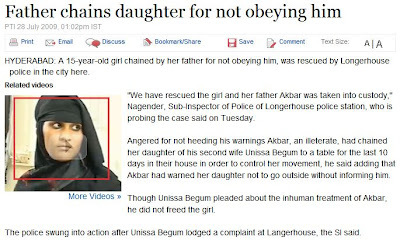 Though Unissa Begum pleaded about the inhuman treatment of Akbar, he did not freed the girl. The police swung into action after Unissa Begum lodged a complaint at Langerhouse, the SI said. Sudden outbreak of common sense?